Click on Photo to see how they were taxed. Personal property taxes were an important component of the tax structure in North Dakota from statehood until the personal property tax was repealed in 1969. Personal property made up approximately 20 percent of the political subdivisions' property tax base, so the personal property tax base was very significant to political subdivisions. However, the personal property tax was unpopular, difficult to administer, and viewed as detrimental to the state's economy because it tended to discourage investment in large items of personal property necessary for farming, business, and industrial development. The personal property tax was repealed in 1969 by exemption of nearly all personal property not required by the Constitution of North Dakota to be assessed by the State Board of Equalization. 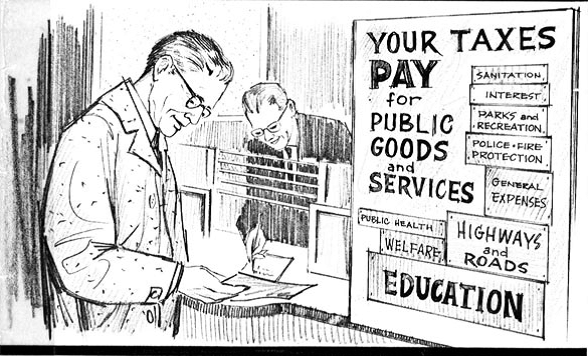 The 1969 bill provided for a one percentage point sales and use tax increase and a distribution of state revenue to political subdivisions to offset the loss of personal property tax revenues. The personal property tax replacement formula, which is codified as NDCC Section 57-58-01, originally provided that each county auditor was to certify to the Tax Commissioner the total amount of real and personal property taxes levied, the total valuation of real property, and the total of real property taxes levied for each taxing district in the county in 1968. The first distribution of personal property tax replacement revenue under the formula was made in 1971 on the basis of the 1968 information. The information collected for the 1968 tax year was used as the base year and a growth factor was contained in the original formula that provided that for each $4 increase in real property taxation within the county the state would contribute an additional $1 over the amount distributed to the county in 1971. In 1971 the distribution formula for personal property tax replacement was amended. Certification and payment dates were advanced, provision was made to include in the formula taxes levied in 1970 for a purpose for which a levy was not made in the year 1968, and adjustments were made to tax bases if classification of property was changed from real to personal or from personal to real property. The most significant change in 1971 was made to the growth formula. The base amount was changed from 100 percent to 95 percent of the 1971 payment and the growth factor was changed from 4 to 1 to 7 to 1. In 1973 school districts were removed from the political subdivisions receiving funding under the formula. For the years after 1973, school district personal property tax replacement has been included in state foundation aid payments. Only revenue for junior colleges and school district public recreation systems continues to be allocated to school districts under the personal property tax replacement formula. In 1985, House Bill No. 1660 amended the personal property tax replacement formula by providing that for years after 1985, payments to counties would be based upon a growth factor of 19 to 1 rather than 7 to 1. This amendment is effective only through June 30, 1987, and after that date the growth factor will revert to 7 to 1. The executive budget recommendations to the 1985 Legislative Assembly included a recommendation for personal property tax replacement funding of $44,500,000 for the 1985-87 biennium. House Bill No. 1005 was passed by the Legislative Assembly providing an appropriation of $44,540,000 for personal property tax replacement. House Bill No. 1005 was vetoed by the Governor, who stated in his veto message that he believed the amount appropriated was "clearly in excess of what the state can afford and is unacceptable." After the Governor's veto, House Bill No. 1660 was passed providing an appropriation for personal property tax replacement of $24,069,346 for the 1985-87 biennium, and Senate Bill No. 2511 was passed providing a deficiency, appropriation of $8,507,654 for personal property tax replacement for the last six months of the 1983-85 biennium. The state revenue sharing formula, presently contained in NDCC Sections 54-27-20.1, 54-27-20.2, and 54-27-20.3, was enacted by approval of an initiated measure at the November 7, 1978, general election. The formula provides that total revenue sharing distributions are equal to five percent of the net proceeds from state income taxes and sales and use taxes. Revenue sharing funds are to be distributed to counties and cities, half on the basis of population and half on the basis of property tax levies. Townships share in the revenue allocated to counties and park districts share in the revenue allocated to cities, with the allocations prorated on the basis of property tax levies. Although the personal property tax replacement formula and the revenue sharing formula provide for determination of a total amount to be due to political subdivisions, and provide for distribution to political subdivisions of amounts due, the total amounts available under both programs are subject to legislative appropriation. Under Section 12 of Article X of the Constitution of North Dakota no state moneys may be disbursed except pursuant to appropriation made by the Legislative Assembly.